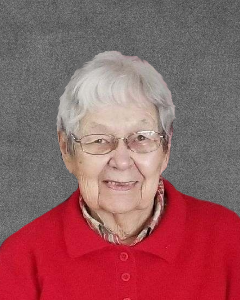 Dolores Lewandowski, age 88, of Hutchinson, Minnesota, passed away Wednesday, October 31, 2018, at St. Cloud Hospital in Saint Cloud, Minnesota. Mass of Christian Burial will be held on Tuesday, November 6, 2018, at 1:00 P.M. at St. Anastasia Catholic Church in Hutchinson, Minnesota, with interment in St. Anastasia Catholic Cemetery. Gathering of Family & Friends will be held Monday, November 5, 2018, from 5:00 P.M. – 8:00 P.M. at the Dobratz-Hantge Funeral Chapel in Hutchinson, Minnesota, and one hour prior to service at the church on Tuesday. There will be a CCW Rosary at 5:30 P.M. and Parish Prayers at 7:00 P.M on Monday at the Funeral chapel. Dolores Mae (Navratil) Lewandowski was born on March 12, 1930 at her family’s home on Swan Lake in Hale Township, McLeod County. She was the daughter of Charles and Emily (Urban) Navratil. Dolores was baptized as an infant and was confirmed in her faith as a youth - both at St. Joseph’s Catholic Church in Silver Lake, Minnesota. She graduated as valedictorian from the Silver Lake, Minnesota High School Class of 1947. On February 8, 1949, Dolores was united in marriage to Leonard Lewandowski at St. Joseph’s Catholic Church in Silver Lake. This marriage was blessed with four children, Donna, Debbie, Doreen and Mark. Dolores and Leonard resided and farmed near Swan Lake in rural Silver Lake for five years. They later moved to Hutchinson, Minnesota in 1954. Leonard and Dolores shared 65 years of marriage until Leonard passed away on September 29, 2014. Dolores was employed as a cook at St. Anastasia Catholic School in Hutchinson, L&S Café in Hutchinson, Swanson’s Truck Stop in Hutchinson and various departments at County Market in Hutchinson. She retired in 1987. Dolores was a devout Catholic who attended St. Anastasia Catholic Church in Hutchinson, Minnesota. She was also a member of the St. Anastasia Council of Catholic Women. In her younger years, Dolores enjoyed spending time outdoors; gardening, canoeing, camping, hiking, working in the yard and swimming with the neighbor kids at her home on Swan Lake. She was a great cook and loved making her special cookies, pies and Sunday family dinners. Her favorite pastimes were crocheting, quilting, and baking. She especially enjoyed spending time with her family, grandchildren and friends. She was known for her strong faith, selfless acts of kindness, compassionate heart and ability to make all those around her feel special. She will be greatly missed by everyone who knew her. Dolores passed away on Wednesday, October 31, 2018 at the St. Cloud Hospital in St. Cloud, Minnesota at the age of 88 years. Dolores is preceded in death by her Spouse, Leonard Lewandowski; Parents, Charles and Emily Navratil; Siblings, Otto Navratil and his wife Lillian, Gladys Kopecky and her husband David, and Francis Navratil.